The Hobbit: The Battle of the Five Armies starts immediately after the closing moments of the previous film. In fact it relives the close of what you see when you watch The Hobbit: The Desolation of Smaug online. The Battle of the Five Armies then proceeds to go further into the repercussions of releasing Smaug onto Laketown and slingshots our story into its conclusion after the first two chapters in Peter Jackson’s The Hobbit trilogy. If you read The Hobbit, then you know that the true third act is really not about a greedy dragon. It’s honestly more about greed itself. There is a whole lot of gold and riches in the dwarves' kingdom that the dragon (voiced incredibly by Benedict Cumberbatch) once sat on, and now a whole lot of factions want their piece of the pie. The problem is that the king of the dwarves, Thorin (Richard Armitage), suddenly does not feel like sharing. Lucky for him, he has Gandalf (Ian McKellen, back for his sixth Middle Earth movie) and Bilbo (Martin Freeman). There is a lot going on in the background of what Jackson shows us in his final The Hobbit movie. Five armies approach and each one has an agenda, yet Jackson does not feel the need to lay it all out there for the audience. Why should he? There are no purer definitions of reasons for war than greed, jealousy and power. Each faction is driven by one of those, if not all of them. Jackson promised a third act to his third chapter that would be a battle scene unlike any we’ve seen prior. And yes, it is thrilling. 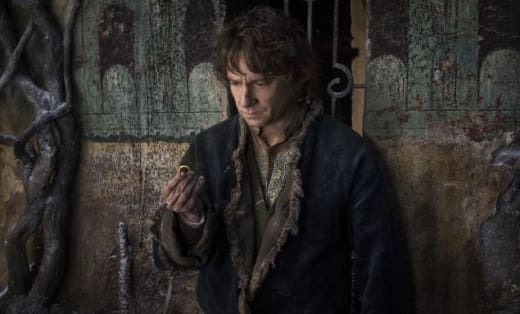 But, for a film that spent two other films getting to where we are now, there are a few moments in that penultimate The Hobbit moment that seem like they are out of left field. But honestly, that does not take away our joy at witnessing this world that Jackson clearly knows so well. The fact that we will never (or will we?) head back to Middle Earth with the man who arguably knows it better than any person making movies is reason alone to witness The Hobbit: The Battle of the Five Armies. Just hanging out in his world for almost 144 minutes is an equal dose of nostalgia, solid storytelling, awesome action and a beautiful bridge to The Lord of the Rings. If we were to delve deeper into the film itself, sure, there are problems. There is no reason why The Hobbit needed to be three movies. It does feel drawn out. 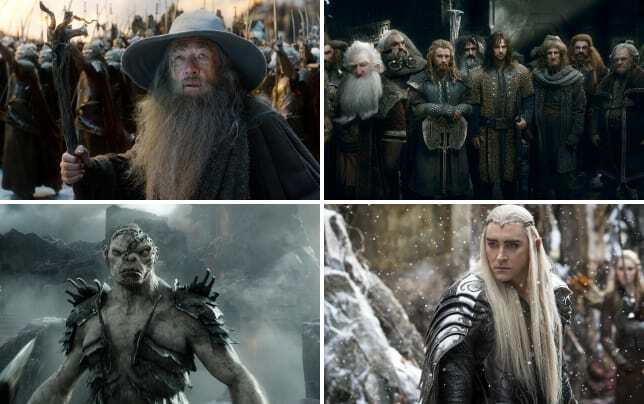 If you watch The Hobbit: The Battle of the Five Armies and then look back at the culmination of what we’ve witnessed, it does seem like a story that could have been told in one 144-minute movie. Yet, our The Hobbit: The Battle of the Five Armies review has to applaud the addition of Legolas and the creation of Tauriel (Evangeline Lilly) to this world. The Elven contingent was suspiciously vacant in Tolkien’s book. Lilly and Bloom joining Lee Pace and his Thranduil is a brilliant storytelling addition. Those are gutsy moves by Jackson and his team and it illustrates that there is no better filmmaker on the planet to bring Tolkien’s imagination to life. For us, too much joy is never a bad thing. In fact, it is something to be celebrated. So, we look forward to visiting The Hobbit repeatedly as we go through life. See how it all got started and watch The Hobbit: An Unexpected Journey online.